Episode 2 of our climate change podcast asks if rising temperatures are going to ruin our sleep. After a sweltering summer in 2015, scientist Nick Obradovich was inspired to investigate the impacts of climate change on getting a good night’s sleep. 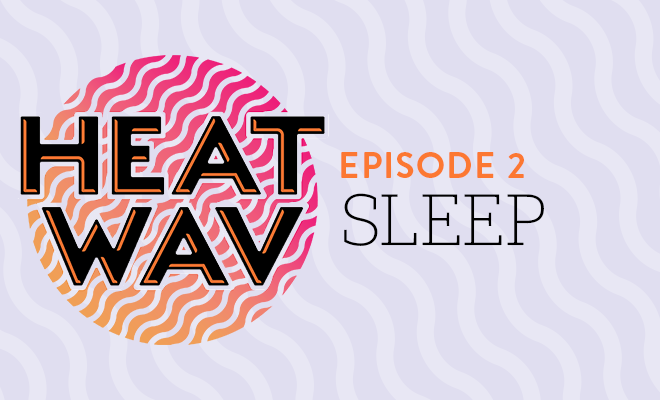 Heat Wav host Ellen Glover talks with Nick about what he learned—and how we should feel about air conditioning. Ellen Glover Hello and welcome to Science Node podcast, an audio series that explores the ways big data and high performance computing are changing the world. Megabytes, gigabytes, terabytes, petabytes of data are being collected every day by researchers everywhere. In this podcast we break that down. We’re looking not only at the latest scientific discoveries, but the multi-billion dollar industry that’s backing them up. Literally. One of the hottest areas of research right now is climate change. Rising oceans, rising temperatures, rising piles of garbage...we’re covering it all in this four-part series. Welcome to the Heat Wav. Ellen Glover Summer 2018 was the fourth hottest summer in recorded history, beat only by 2017, 2016 and 2015, according to the National Oceanic and Atmospheric Administration. We’re going to take it back to summer 2015, though. Apple was on the verge of announcing the release of the 6s, The Weekend and Bruno Mars were conquering the airwaves, and Nick Obradovich was sweating in his California apartment...That would continue into autumn. Ellen Glover Obradovich was a political science doctoral student at the University of San Diego. According to meteorologists, thanks to an exceptionally warm ocean, the city’s temperatures were almost 8 degrees higher than average. While the usual temperature is around 74 degrees, some parts of the city got up to 99 degrees that month. Nick Obradovich It was quite warm during the day and, importantly, during the night it really didn’t cool down very well. San Diego doesn’t have very good air conditioning infrastructure and neither did the place we were staying. So at night it was kind of hot and sweaty and you’d go from putting just the sheet on to it’s too hot to have the sheet on to now I’m a little bit cold and pull the sheet back on. Really, I wasn’t sleeping very well and my partner wasn’t sleeping very well either. Ellen Glover It goes without saying, sleep is extremely important for maintaining one’s health. Nick Obradovich Sleep for the human body is, arguably, the most important thing that you can do. Severe lack of sleep can produce and has been associated with almost every malady that you can think of. It increases the risks of various illnesses, it decreases cognitive functioning, harms the ability of our immune system to fight off pathogens, it increases long-term chronic disease, affects our mood and our ability to be interacting positively with other people, impacts our productivity at work, impacts efficacy in the job we do, the actual ability to hold down a job. Basically, if you have systematic and severe insufficient sleep, your life is harmed in myriad ways. Ellen Glover And Obradovich was starting to notice some of the immediate effects in his everyday life. Ellen Glover And it turns out someone had looked into that...well, sort of. Previous sleep studies had been done to show a correlation between sleep quality and ambient temperatures. But, Obradovich wasn’t finding anything that looked at how folks were sleeping in their own beds. The small samples collected in labs couldn’t effectively be translated to what was going on in the general population. So he figured he would do it himself. He first turned to the Behavioral Risk Factor Surveillance System. Nick Obradovich This surveillance survey is one of the largest public health surveys in the world and what they do is they randomly call US citizens with telephones and ask them a whole host of public health related questions. Each year they do this for hundreds of thousands of Americans. So you have this representative – well, largely representatively sampled – group of people answering all of these questions. Ellen Glover The survey asks questions about things like one’s general health, their access to healthcare and their exercise habits. Luckily, it also collects information on how well people sleep. They even have individuals rate the number of nights of insufficient sleep over the last thirty days. Nick Obradovich The nice thing about that is that gave us a temporal reference for that person’s sleep that we could link to the temperature data. When coupled with the geographic reference of what city that person lived in, we now could actually map the night time temperatures they experienced on to the self-reports of their sleep quality. We ended up with about 765,000 responses to the survey from people all across the US that we were able to look at. Ellen Glover These responses were then compared to temperature data collected by the National Centers for Environmental Information. They were also compared to climate projections by NASA’s Earth Exchange (NEX). These are really large data sets, so Obradovich and his colleagues looked to Gordon, the world’s first flash super computer, that is based in the San Diego Supercomputer Center. Nick Obradovich We just needed to extract the daily temperature forecast data from these small grid cells from the NASA NEX product to the cities that we had in our sample. We had to do that for each city all the way out in the future to the same files as that city. That is actually a relatively computationally intensive process and, rather than trying to burn up a couple of laptops to do it, we used Gordon’s processing power that we had access to aid with that. And then, once we did that, we used it all to do the forecast and related modeling. Having access to Gordon made this a few day process instead of a process where we had to purchase new hardware and then run it for possibly weeks to get all of this done. It sped it up and made it a lot easier. Ellen Glover The study was published in Science Advances, and it predicts that, if climate change persists at the same rate it is now, warmer temperatures could lead to six additional sleepless nights per 100 individuals by 2050. By 2099, it could be as many as 14 nights of tossing and turning. The main finding was that every additional degree Celsius of nighttime temperature translates to three nights of insufficient sleep per 100 individuals per month. To put that into context: If we had a single month where the nightly temperature averaged about 1 degree Celsius higher than normal, that would mean 9 million restless nights across the US population. That’s 110 million nights of insufficient sleep annually. Nick Obradovich The main takeaway is that, indeed, unusually warm night time temperatures – especially in the summer – appear to harm people’s sleep quality and the amount of sleep that they get. More vulnerable citizens in the population – the elderly and the low income, as well as low income elderly people – exhibited the largest effects that we saw in the sample. Those subgroups. For the elderly, there’s fairly good literature on the lack of the ability to do what’s called thermal regulate, to regulate our body temperatures as we age. So elderly are more susceptible to more extreme temperatures because their bodies can’t physiologically adapt as well. And then for the lower income people and the higher effect that we observed in that sub category, we think – we don’t know for sure – but we think that access to air-conditioning is probably the primary reason why we see lower income people having a larger response. Ellen Glover And, like so many other things tied to climate change, these problems aren’t going away any time soon. In fact, unless something changes, things could get a lot worse. Especially now that the world’s population is becoming more technologically advanced and reliant on electricity. Nick Obradovich The entirety of India right now is basically not yet rich enough that you can have large amounts in air conditioning. But as soon as India is rich enough, on average, to get and afford air conditioning, I would anticipate that the entirety of the country will buy that technology and will, accordingly, have to pay for the electricity associated with running air conditioning units all over India. If you look at the amount of energy that would be associated with that technological change, it’s massive. And if that energy is being produced by carbon intensive electricity sources, then the amount of carbon that will be produced from that technological adaptation will also be massive. Really, the only way to prevent that is to try to, as rapidly as possible, decarbonize India’s, our, and basically the rest of the world’s electricity infrastructure before the added demand for added air conditioning comes into play. Ellen Glover Although the world’s growing reliance on air conditioning is frightening, Obradovich, now a research scientist at the MIT Media Lab, insists that air conditioning is not the enemy. Nick Obradovich I actually think that, arguably, one of the most important ways humanity is going to adapt to changing climate is via the added use of air-conditioning. We want to very much not look at air-conditioning as a bad thing. Air conditioning is a very good thing, and it helps smooth many of the shocks that the climate impacts community has identified, myself included. We need more of it, we need a lot more air conditioning. The bad thing is not air conditioning, the bad thing is the carbon and the energy that the air conditioning might use. So we need to try to pull out all stops to remove the carbon from that equation. Ellen Glover Simulations like this one are helpful, even if they are bleak sometimes. However, tune in next time to find out why one group of scientists believes some of these simulated models may not be as trustworthy as we think. This episode of Heat Wav was brought to you by Science Node, an online magazine developed in collaboration with organizations in the US and Europe to bring information exploring the real-world impact of advanced computing and networks to experts and non-experts alike. For more information about the research discussed today, you can find the paper on ScienceAdvances.org – direct link will be on the website. I’m your host, Ellen Glover. See you next time. Music credits: “Memory” by Creo; “Laid Back Fuzz” by Podington Bear; “Blur” by Nctrnm; “New Skin” by Podington Bear; “Slovenly” by Shaolin Dub; “Sullen Faced” by Ketsa. Thank to you our underwriters, who have supported us since the transition from International Science Grid This Week (iSGTW) into Science Node in 2015. We are incredibly grateful.